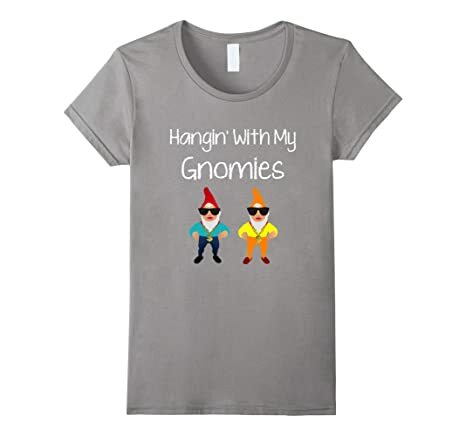 Gnomes or garden dwarves as they are otherwise known make for really adorable and cute decor for both the home and the garden yard or any outdoor space. It is believed that the humble gnome works very hard to protect property from evil sorcery and malicious magic. 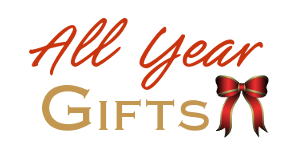 So he makes an ideal gift for fans of all things fairy and make-believe. 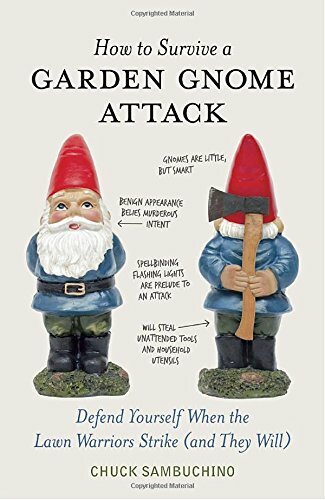 These gnome figures also seem just perfect for someone who's recently moved into a new home because they are said to ward off any threats to the property. ⭐ These items should suit any fan or lover of this bearded little guy with the very recognizable pointy hat. 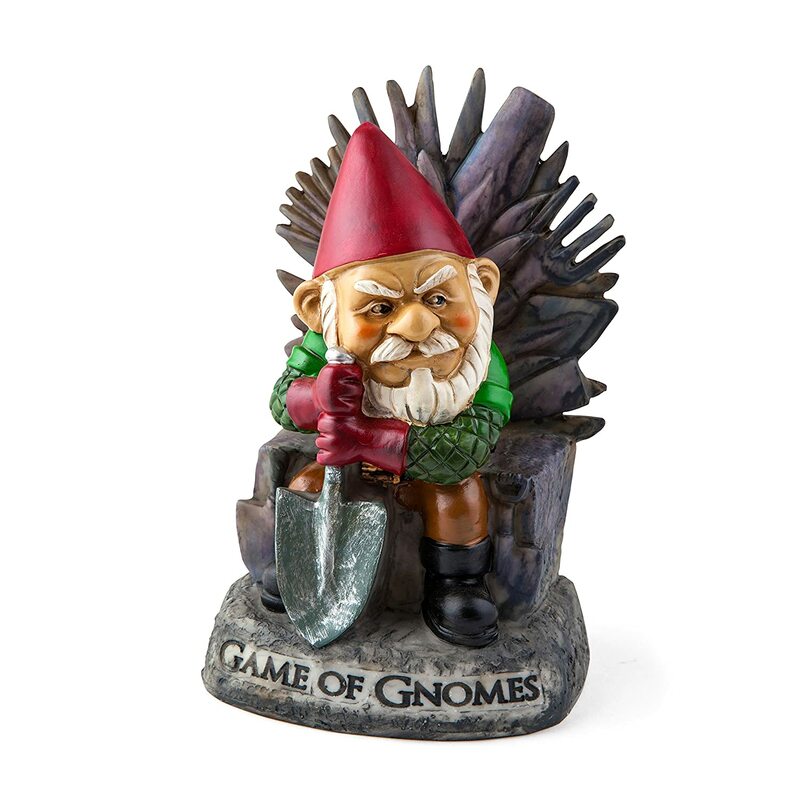 You’ll find a great range of garden gnome gifts and merchandise on this page. So don’t be gnoming home anytime soon; you’ve got a great assortment of merchandise and items to see. Let’s take a look. This is a pair of pretty cute looking salt and pepper shakers. These seem like truly adorable pals to liven up any kitchen. 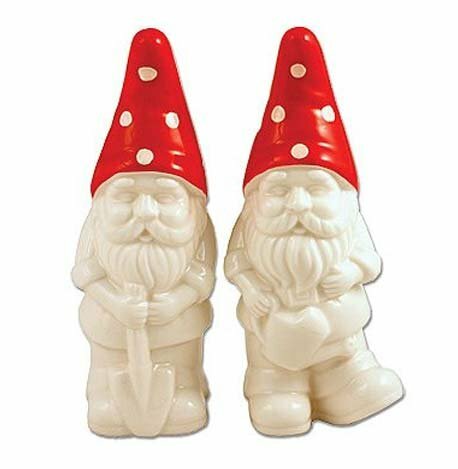 There are a couple of cute gnomes in the form of ceramic salt and pepper shakers. They are plain except for the striking hand painted red hats and are a good, practical size at just over 5 inches tall. These two little guys could be great fun to spice up the kitchen or to put out on display elsewhere in the home. 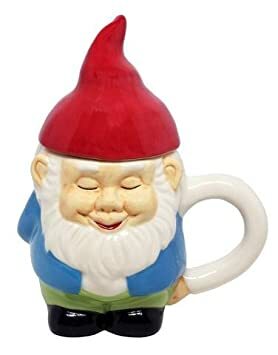 Also as a garden gnome gift for the kitchen and home, look out for a gnome cookie jar. There is one where he looks like he’s stealing the cookies. He has a red hat and he’d make a very cute looking addition as a gift. Just don’t fatten him up with too many treats. 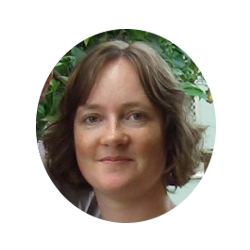 There is a lady version to look out for as a cookie jar too. I love the look of this winter themed candle holder. Here a snowman and his gnome friend get warm with a tea light candle. I think this makes for a sweet Christmas or winter themed gift. The design is very endearing with the figure wrapped up in his winter woolies and his snowman friend too. They are both warming themselves in front of what looks like a fire when you add in a lit tea light candle. Alternatively, you could add a flameless version instead. Note that the actual candle is not included in the sale. This should be perfect for display in the home and to add to the Christmas and festive decorations. What a lazy sleeping fellow. This one is on strike so maybe we should send him back to work. That’s not part of the rules. 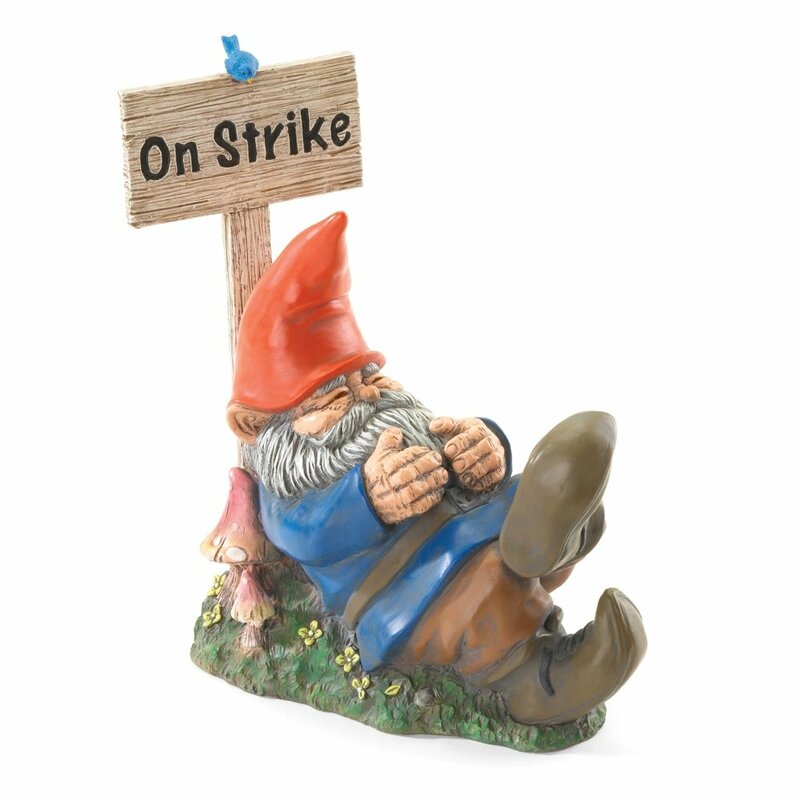 This garden gnome's on strike when he should be protecting a garden from unwanted pests and intruders. The on strike design is a really cute and colorful looking indoor or outdoor statue that is sure to bring a smile to the faces of anyone who is paying a visit. You may want to check the sizing if you want this to go outside. Every yard should really have their own lazy, on-strike, sleeping gnome statue. How about getting it as a gag gift for someone at work. 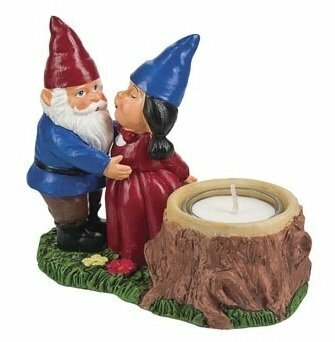 Enesco are well known for making good quality gnome figurines for home decor. There’s one really cute addition in the range with a very tall, red hat and blue clothes. He comes in some fun packaging which states that he will help with the housework. Who knows what magic these little creatures get up to while we’re asleep. Here’s a romantic couple, snuggling up together on a log. It’s a 12 inch high ornamental statue made from resin and it can be used inside or out. Mr and Mrs look very content with each other and would add some real magical charm wherever they are placed. There are plenty more colorful garden statues for the yard, some with mushrooms, toadstools and ladybugs too. 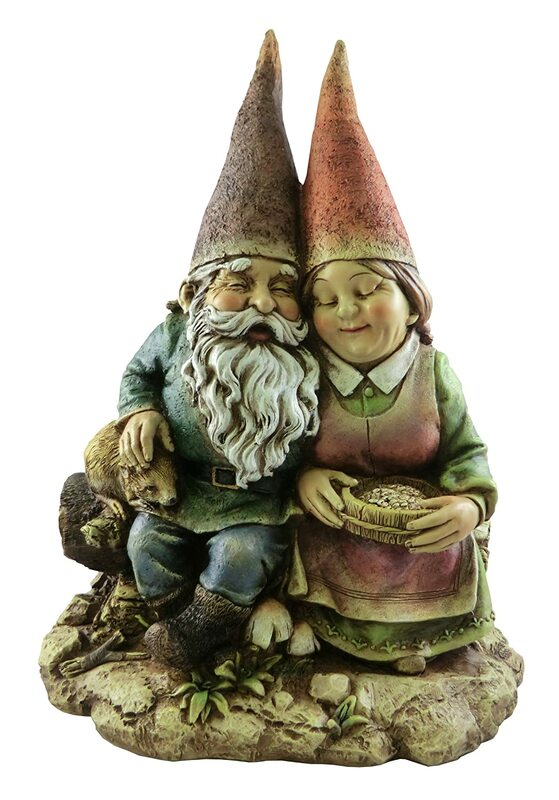 Garden gnomes make wonderful looking welcome sign statues for indoor or outdoor use. One statue is very colorful and has two cheeky chappies who look like they are having a very good conversation with each other. I think these look like your typical Irish chaps because they love nothing better than having a good old yarn. There is lots of detailing with mushrooms, ladybugs, leaves and a frog too. Are they just a gnome at heart.